As I have been swept up in the 2006 Football World Cup I decided to read a football/cricket book. Not being a football fan I was expecting a bit of ‘a hard slog’ during the football sections, but in the end I enjoyed them as much as the cricket, the art, and the opera sections. 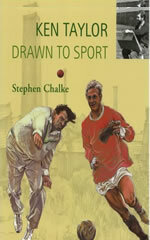 This is a great book by Stephen Chalke, who is one of the new breed of quality English cricket writers. Chalke does not just concentrate on his subject but writes about all of the characters of interest that his subject meets throughout his life. Ken Taylor is unfortunately a thing of the past, a county cricketer for Yorkshire in the summer and a professional football player for Huddersfield Town in the winter. He completed 313 first-class cricket matches, including three Tests, and 301 Football League matches. As impressive as his sporting career is, that is only half of the Ken Taylor story. He is also a first-class artist good enough to study at the Slade. Not bad for a young Yorkshire boy who shared a bed with his brother Jeff until the age of 10. His brother Jeff was also a professional football player, but even more incongruently he became an opera singer performing with the likes of Pavarotti and taught artists such as Anthony Michael Moore. Some of the footballers we meet are Ray Wilson, Denis Law, Stanley Matthews and – my favourite study in the book – the legendary Liverpool manager Bill Shankly. On the cricket side we learn about Fred Trueman, Brian Close and a young Geoffrey Boycott, who managed to run Ken Taylor out on their first occasion of opening together. They did not open together again until the following season. The result? G. Boycott not out 165, K. Taylor run out 37. The book is beautifully produced with a number of four-colour reproductions of Ken’s artwork; both sporting and landscapes. I was hoping they would explain the one of Denis Law, which features him dribbling the ball holding one boot. Ken’s artwork first came to public prominence when he supplied the drawings for Stephen Chalke’s first book Runs In The Memory – a great book that was received with rave reviews, but which Chalke was unable to find a publisher for. Chalke received comments from publishers such as “wonderful but a little to specialised… Ideally I am looking for biographies fronted by well-known and established names”. These comments led him to publish the book himself and his company ‘Fairfield Books’ has now published 14 books, including publications by David Foot. As promised last week here is David's review of Chris Arnot's new book, which looks like a must have for the nostalgic amongst us.